Fashion sneakers are the darlings of the athleisure scene & the most nonchalant finishing touch to almost every outfit. Whether you consider yourself the Gigi of your friends or the hippest mom in town, here’s how to style your fashion sneakers. Use them play up sharp contrasts between casual and dressy pieces. Be bold and try different versions of the many, many fashion sneaker styles out there. Keep reading to see more ideas on when to wear fashion sneakers! Want to dress down for your next date night? Take a printed dress, then pair it with a casual button-up shirt tied around your waist. Swap the expected heels or flats for a pair of casual, slip-on sneakers in leather or suede. Slide into joggers, throw on your softest tee and top it off with the jacket du jour—a sporty bomber! Perfect for a morning coffee run or a full day of running errands. Tap into the top denim trends of the moment and reach for fresh, white skinny jeans this spring. 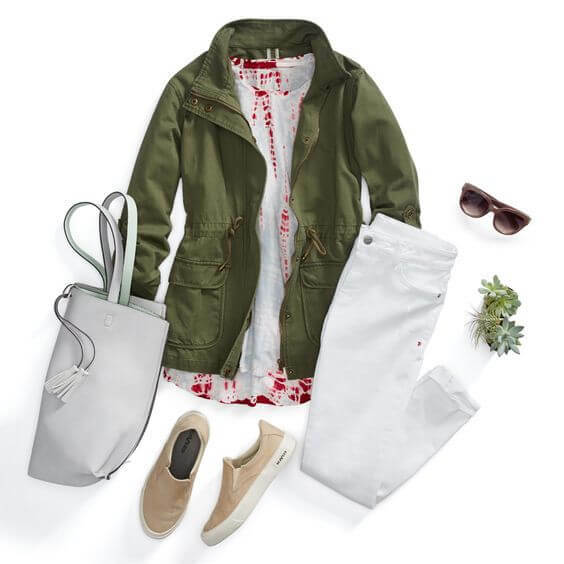 Add a casual, bohemian tee and layer on a cool cargo jacket. You’ll be ready for the farmers’ market in a snap! When style meets comfort as it does with the well-loved fashion sneaker—everyone wins. How will you wear your fashion sneakers? Tell us!